Come on! The New Year is coming, don't we need to move on and get ready for it! Today, we will introduce you to something new in 2017 for Heartlight.org and VerseoftheDay.com in partnership with Next Generation for Christ! But we will do that in the context of Jesus' story. Take a few minutes and get the story. Then, you will arrive at the announcement and the video. Isn't Christmas over? Don't we need to get on with life? Don't we need to come back to reality — our reality — and get on with doing something productive? Come on: The New Year is coming quickly, and we need to get ready for it! Haven't we heard enough on Bethlehem for this year? While I can appreciate being ready to move on to the challenges of a New Year, Bethlehem is about reality — gritty reality, the kind of reality we face today. You see, Bethlehem was a small and forgotten little village when Jesus was born. It had once been famous as Kinug David's home city. Even then, however, Bethlehem was a gritty little place, filled with the reality of hard life in difficult times. Shepherds on the nearby hillsides raised the sheep that would be used as sacrificial lambs at Passover in Jerusalem. Shepherds eked out a living raising sheep, fighting predators, and living near the place of war. Bethlehem symbolized the grit of hard work, forgotten yet devout people, and a life of sacrifice. Bethlehem was also a dominant part of Jesus' story for the first two years of his life. Joseph and Mary went to Bethlehem, Joseph's home city, to register for the census (Luke 2:1-7). While many from Joseph's family had to do the same thing, none of them shared a room or offered help to Joseph and Mary when Jesus was born. Our first glimpse into "The Grit of Grace" involves the abandonment of Joseph and Mary by all their family when Jesus was born in Bethlehem (Matthew 1:18-25). Mary's miraculous conception of Jesus was impossible... unbelievable... not understandable. So, most in both of their families assumed this miraculous conception was a lie... that Mary was dishonorable... that Joseph was a fool for keeping her... that Joseph was not Jesus' real father. This cynicism about Jesus' father still lingered as Jesus began his ministry and he was still known as "Mary's boy" (Mark 6:3 MESSAGE). This first chapter in "The Grit of Grace" focuses on God, the Almighty, who was willing to enter our pain and bear our shame to redeem us from all that has held us captive. The second glimpse we get of "The Grit of Grace" also occurs in Bethlehem. When Jesus was born, he was born in a stable, placed in a manger, and wrapped in strips of cloth (Luke 2:4-7). God, the King of glory, chose to enter our world as a peasant born to devout parents who were poor. Not one would offer them a room, so Jesus was born in a place animals slept on cold nights. Baby Jesus was welcomed by shepherds who were not allowed in the synagogue because they were deemed less than worthy of the privilege by those who considered themselves religious and devout (Luke 2:8-20). This second chapter in "The Grit of Grace" reminds us that God's glory can come to any of us open to seeing his promises fulfilled and his glory displayed. The third glimpse we get of "The Grit of Grace" involves violence, hatred, manipulation, and genocide (Matthew 2:1-18). We meet devout seekers from a far off land, a heretical religion, and what was often an enemy nation. However, these seekers came a great distance to welcome Jesus, born King of the Jews. Herod's jealousy was aroused and his legendary violent anger unleashed under the guise of religious interest. The malevolent king used religious scholars to determine that this rival king was born in Bethlehem. He then used this information to commit genocide. Herod was hell-bent to destroy any rival, no matter his age. So, Herod had soldiers murder all boys, two years old and younger, based on the information he received from the Magi. This third chapter in "The Grit of Grace" reminds us that to defang violence of its destructive power to destroy humanity, Jesus entered our world of violence to share our mortality and to defeat the power of death that had terrorized all people (Hebrews 2:14-18). Bethlehem was the center of focus for the first two years of Jesus' life. We do not know exactly how long after Jesus' birth the Magi arrived. Months had passed. We do know that Joseph and Mary had moved from the stable to a house (Matthew 2:7-11). The Magi had come, worshiped, given their gifts, and gone home another way without informing Herod. Joseph had been warned in a dream and took Jesus and Mary to Egypt for safekeeping. 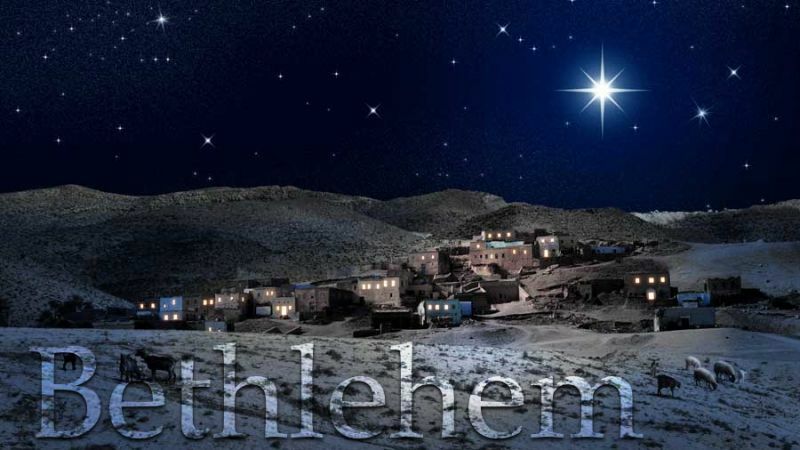 Far from being a quaint and safe little place confined to Christmas cards, Bethlehem is the great reminder of the gritty reality of our Savior's story. This village is our wake-up call. Jesus' Bethlehem stories are not mere religious stories. These Bethlehem stories are far more than sweet little stories to tell with sentimentality to children at Christmas. No, these stories are full of the grit and reality of the world in which we find ourselves. They are reminders that God came to live among us in Jesus. And when God came to us in Jesus, he did not come as a protected and pampered guest, but as one intimately involved in the trouble of our broken world. All of this, dear friend, becomes our Bethlehem story about "The Grit Grace" that has redeemed us! The Birth of Jesus Christ — Story of Redemption 4.1 from James Nored's work that is both published and also now in video production. When God came to us in Jesus, he did not come as a protected and pampered guest, but as one intimately involved in the trouble of our broken world. For more on the video series and The Story of Redemption, please check out James Nored's work that is both published and also now in video production. These three keywords — BROKEN, BRIDGE, BLESSING — form the basis for an emerging outline on sharing our faith that you watch develop over this next year at iBELIEV3.com. 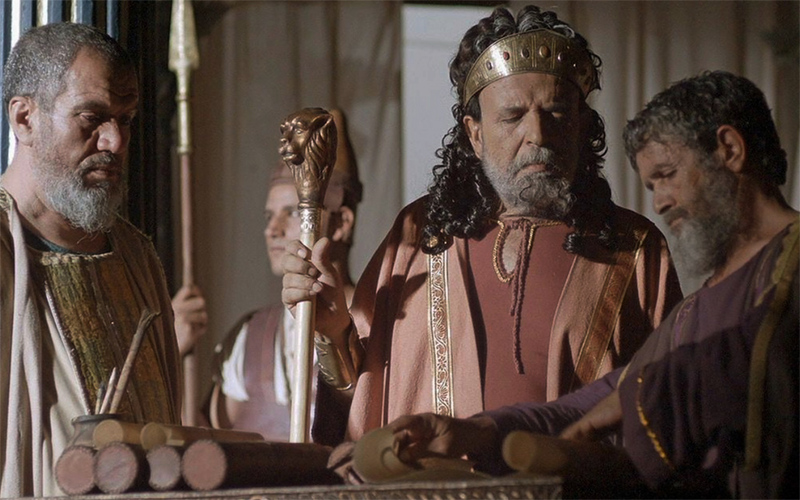 Special thanks to Free Bible Images for the picture of Herod and the Scribes discerning that the Messiah, King of the Jews, was to be born in Bethlehem. "The Grit of Grace" by James Nored and Phil Ware is licensed under a Creative Commons License. Heartlight encourages you to share this material with others in church bulletins, personal emails, and other non-commercial uses. Please see our Usage Guidelines for more information.